13 Full Scholarships were awarded to deserving students at the Uptown Music Collective. The Uptown Music Collective would recognize and thank Jane Darrow, and her son Jesse Darrow for their continued stewardship of the Alice Hileman Memorial Scholarship Fund here at the Collective. This was the first scholarship fund established here at the Collective. This fund was started in 2009 by in memory of her mother, Alice Hileman, and was the catalyst for the UMC Scholarship Program. We are extremely grateful to have this long-standing scholarship renewed year after year. 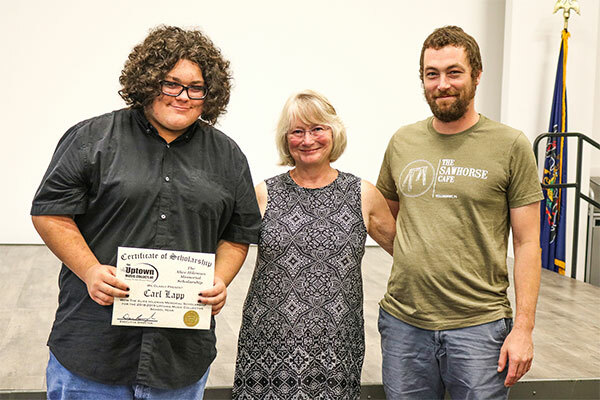 The recipient of this scholarship is Carl Lapp. Carl is brand new to the Uptown Music Collective and began participation in our programs this month. The Uptown Music Collective would recognize and thank The Angelina’s Song Foundation for the newest addition to the Collective’s scholarship lineup, the Angelina’s Song Scholarship. 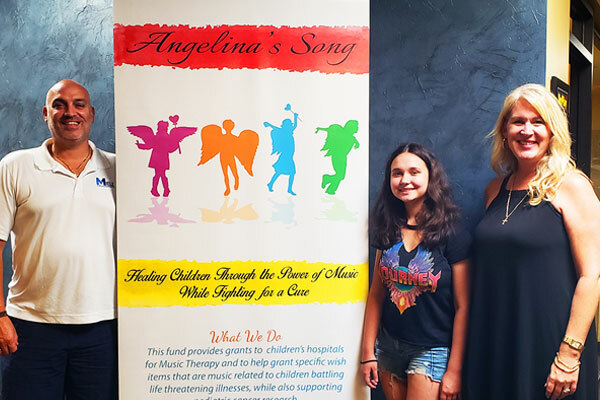 The Angelina’s Song Foundation’s mission is to help create and improve music therapy programs in children’s hospitals across the nation, to offer music-related wish items to sick children and teens, all while supporting pediatric cancer research. This scholarship is to go to a student who has been diagnosed with a critical or chronic illness, or who aspires to become a music therapist. This fund will provide 1 full scholarship for the 2018-2019 school year to a student who meets these specifications. We would like to thank the stewards of this scholarship, Nicole and Lou Miele for starting this scholarship fund with us this year and bringing the UMC into the Angelina’s Song family. The recipient of this scholarship is Isabella Cole. Isabella has been a vocal and piano student here at the Collective for going on 6 years. She is one of our most outstanding vocalists in our special performance program. She was one of the founding members of our community performance program participating in our first ever CPG known as Urban Souls. She is also a mentor in our Student Teacher Outreach Mentoring Program, also known as STOMP. Most recently Isabella sang the national anthem at the 2018 Little League World Series! Awarded to Ashlyn Bird and Abigail Jamison. The Uptown Music Collective would like to thank the Blaise Alexander Family Dealerships who began The Blaise Alexander Family Scholarship Fund last year and continued it this year through sponsoring our Scholarship Fundraising Performance this past January at the CAC. This fund will provide 2 full scholarships for the 2018-2019 school year. We would like to thank the Blaise Alexander Family, especially Adam and Aubrey Alexander, for their continued stewardship of these scholarships. The first recipient of this year’s Blaise Alexander Family Dealerships scholarship is Ashlyn Bird. Ashlyn has been a Collective student for 7 years studying piano and vocals. She is a member of Special Performance Group 1 as a Keyboardist and a member of the Community Performance Group, Sonic Wall Party. 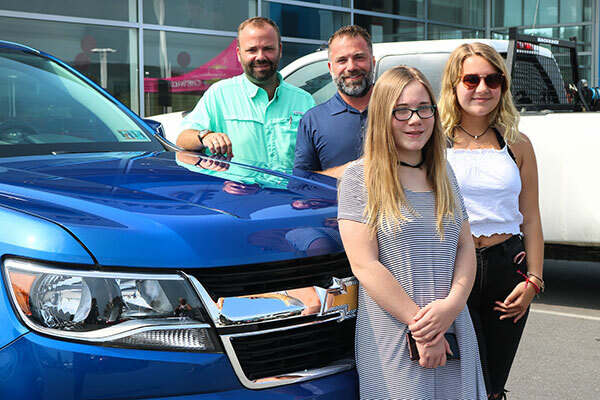 The second recipient of this year’s Blaise Alexander Family Dealerships scholarship is Abby Jamison. Abby has been a Collective student for over three years taking vocal lessons. Abby is an active participant in iOn Uptown and a UMC Vocal Workshop. 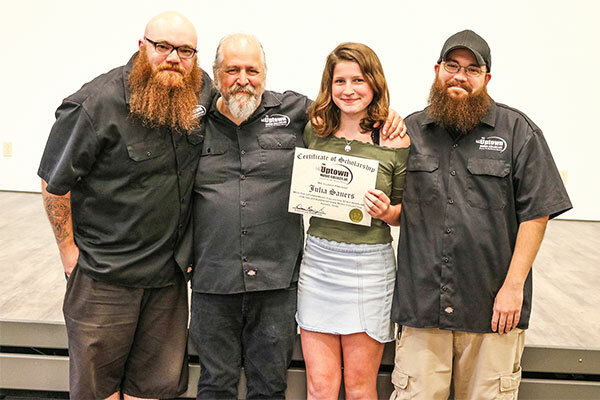 The Uptown Music Collective would recognize and thank The Brickyard Restaurant and Ale House and The Stonehouse Wood Fired Pizza & Pasteria who began The Brickyard & Stonehouse Scholarship Fund last year here at the Collective and continued it this year. This fund will provide 1 full scholarship for the 2018-2019 school year. 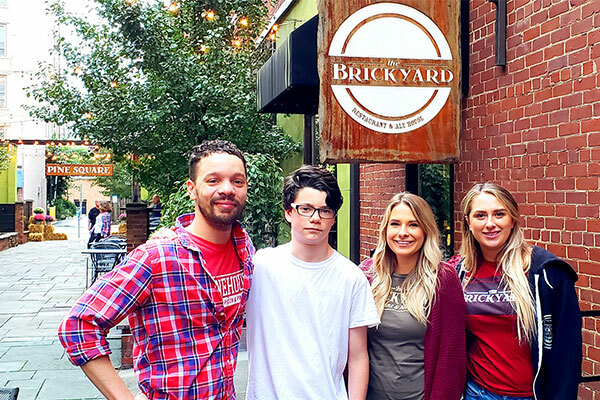 We would like to thank our neighbors at The Brickyard and The Stonehouse, especially Tony Ecker, for the continued support of the Collective and stewardship of this scholarship. This year’s recipient is Alonzo Chapman. 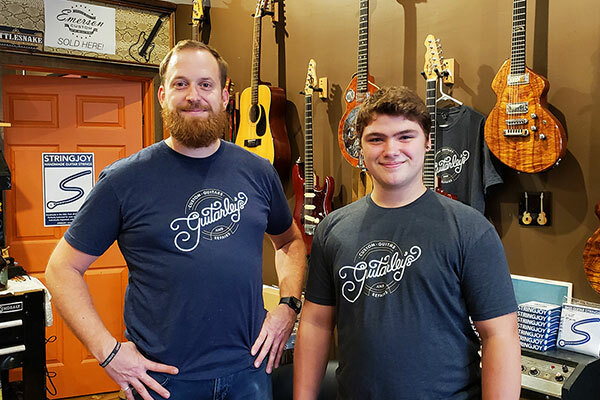 Aj has been a student at the Collective for over two years, starting out as a Summer Music Camp participant before becoming a full-time guitar student. Aj is heavily involved with the Tech Monkey and iOn Uptown Programs as well as participation in our Student Showcases. Aj is pictured here with the management crew of both The Brickyard & The Stonehouse. 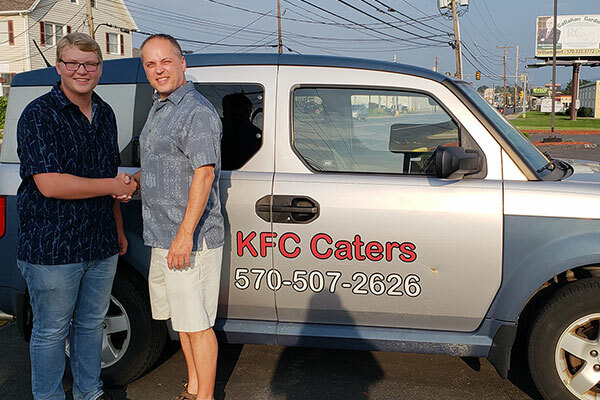 The Uptown Music Collective would like to thank Keith Cole and his entire crew at KFC – Kentucky Fried Chicken for being the stewards of The Colonel’s Community Scholarship Fund for another year here at the Collective! This fund provides 1 full scholarship for the UMC school year and is based upon merit. Students do not apply for this scholarship but are chosen by the UMC Staff based upon their dedication, ability, and work ethic. The recipient of this scholarship for 2018-2019 is Tate Berkey. Tate has been a student at the Collective for over four years. He is one of the top drummers in both of our performance programs. He recently made the trip to Memphis with the Collective’s 3rd Street Blues Band during the 2018 International Blues Challenge Youth Showcase. Tate is also heavily active in his school’s marching band and music program. Tate just started his senior year of high school. The Uptown Music Collective would recognize and thank the First Community Foundation Partnership of Pennsylvania, especially FCFP President & CEO, Jennifer Desmond Wilson and Director of Grantmaking, Betty Gilmour for the continued stewardship of The Lew Gilberti Memorial Scholarship Fund. This fund was started in memory of local musician Lew Gilberti by his family and friends and will provide 1 full scholarship for the 2018-2019 school year. The Uptown Music Collective would recognize and thank UMC Alum, Sean Robert Farley for starting the Guitarley’s Scholarship Fund this year at the Collective. This fund will provide 1 full scholarship for the 2018-2019 school year and is given based upon merit. Preference is given to up and coming guitar students as per the steward’s request. Students do not apply for this scholarship but are chosen by the UMC staff based upon their dedication, ability, and work ethic. We would like to thank Sean, the owner/proprietor of Guitarley’s, and the steward of this new scholarship fund here at the Collective. The recipient of this scholarship is Dom Fredin. Dom has been a guitar student here at the Collective for over two years. He has performed in our Community Performance Program and is starting his first performance season with the Special Performance Program this year. Dom has shown growth and a real aptitude to the guitar which makes him the perfect candidate for this scholarship. Awarded to Cameron Temple and Connor Evans. 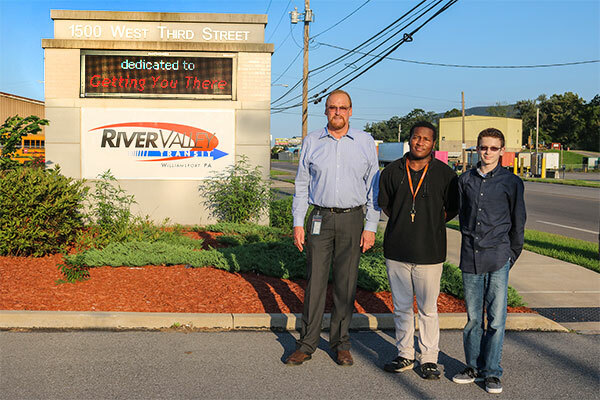 The Uptown Music Collective would recognize and thank River Valley Transit who began The River Valley Transit Scholarship Fund last year and continued it this year through sponsoring our Scholarship Fundraising Performance this past January at the CAC. This fund will provide 2 full scholarships for the 2018-2019 school year. We would like to thank the RVT crew, especially William Nichols for making this fund possible. Both of this year’s recipients of the River Valley Transit scholarships are BRAND NEW to the Uptown Music Collective and will begin participation in our programs in September. They are Cameron Temple and Conner Evans. We look forward to following their musical journey here at the Collective. Awarded to Stephanie Nappi and Mackenzie Powell. 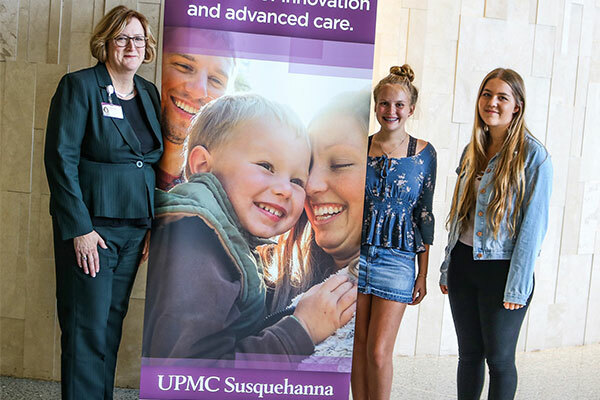 The Uptown Music Collective would recognize and thank UPMC Susquehanna for their brand new addition to the Collective’s scholarship lineup, the UPMC Susquehanna Scholarship Fund! UPMC started their fund this year through sponsoring our Scholarship Fundraising Performance this past January at the CAC. This fund will provide 2 full scholarships for the 2018-2019 school year. We would like to thank UPMC Susquehanna and especially Patricia Jackson for making this fund possible. The first recipient of this scholarship is Stephanie Nappi. Stephanie has been a piano and vocal student at the Collective for the past year and a half. She is an active participant in our Tech Monkey program as well as various Collective workshops. She recently joined a UMC Community Performance Group in September. The second recipient of this scholarship is Mackenzie Powell. Kenni has been a student here at the Collective for over four years focusing primarily on vocals but has also taken keyboard lessons during her time here. She is a leader in our Tech Monkey & iOn Uptown programs, helping to instruct the younger students, as well as a member of our Community Performance Program and our Special Performance Program having performed on the CAC, CTL, and Millbrook stages for the past two years. 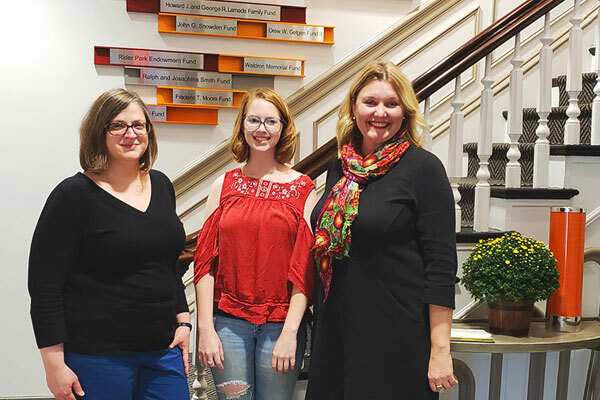 The Uptown Music Collective would recognize Collective Student Julia Sauers for receiving the 2018-19 UMC Staff Scholarship. This scholarship is funded by the money raised at our yearly Scholarship Fundraising Performance at the CAC. This fund will provide 1 full scholarship for the 2018-2019 school year and is based upon merit. Students do not apply for this scholarship but are chosen by the UMC staff based upon their dedication, ability, and work ethic. Julia has been an outstanding student at the Collective going on six years studying guitar and vocals. She is a leader in our Tech Monkey & iOn Uptown programs, helping to instruct the younger students, as well as a member of our Community Performance Program and our Special Performance Program having performed on the CAC, CTL, and Millbrook stages for the past two years.